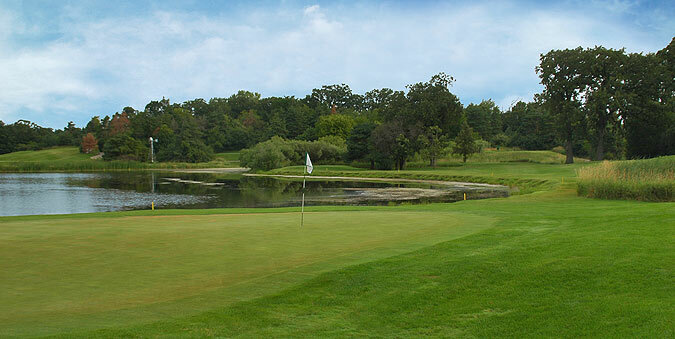 Stonewall Orchard in Grayslake, just northwest of Chicago is an Arthur Hills design that has been recognized as one of the top public courses in the Chicago area. The natural rolling landscape features more than 65,000 fully mature pine and oak trees, with manicured fairways bordered by tall grasses and wetlands that are teaming with native wildlife. 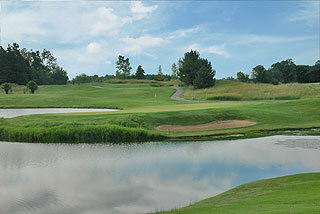 Rated 4 stars by Golf Digest Places to Play, this layout has unique qualities that make it challenging and fun to play. Along an undulating terrain golfers will encounter sculpted tee boxes and bunkers, gorgeous, mildly sloping greens and a great variety in holes, designed to keep players on their toes. The beautiful 5,100 square foot clubhouse includes a pro shop stocked with golf attire and accessories, a restaurant and lounge that can accommodate up to 200 people for outings and special events, and restrooms that provide changing areas with showers. A spacious grass range is directed towards target areas with bunkers, and a huge practice putting green fronts the clubhouse. On course golfers will find the fairways are well marked with 150 yard stakes visible on all par four and fives, and sprinkler heads that are measured to the center of the green. Especially appreciated is the fact the cart paths are marked with blue, white and red stripes that indicate the 200,150 and 100 yard areas. During inclement weather when it is cart path only, this feature really comes in handy. Pin placements are outlined on the scorecards, which also provide hole diagrams. Four sets of tees intersperse the yardages with about a 500-600 yard differential. The silvers measure 7124/140 slope, the golds 6506/136 slope, the whites 6032/130 slope and the forward turquoise tees measure 5375 with a slope of 126. The 150 stake is a great target on the beginning hole, which presents a wide fairway that leads to an elevated green, with considerable room for error - a good starting hole. Number two is also quite open up until the 110 yard area, as a water hazard rests between the end of the fairway and the putting complex. The approach over water warrants contemplation...anything long is trouble. The first of 4 par fives follows, and begins from an elevated tee with a long, narrow bunker awaiting tee shots mis-hit to the left. A shot played over the edge of this sand trap, landing past the 270 yard area will create an opportunity to reach the slightly downhill green in two. On four the best tee shot will land left of the evergreen and short of the bunkers on the left about 85 yards from the green. The fairway slopes left to right and is quite undulating. Long is gone on the approach, as the water hazard along the right meanders immediately behind the putting surface as well. The par 3 fifth is nearly all carry over water, and is followed by a long par four that invites a grip it and rip it mentality. Avoid the fairway and greenside bunkers and this #5 handicap can be had. There is plenty of room on the seventh fairway, but the undulations one will encounter after the tee shot and also greenside can create some tricky approaches. The # 1 handicap is next - a beautiful par five over a wetland (from all but the forward tees) to a fairway that slopes from right to left towards the hazard. Played as a three shot hole, the second should land short of the center bunker about 60 yards out, leaving an accurate wedge to a putting complex bordered by more marshland immediately left - tough hole. The finishing hole on the front plays from an elevated tee area to green protected by water on the right, with a bunker in back that may save shots hit past the green from reaching the hazard. There is some bail out room short left. 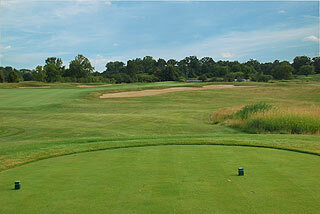 The wide fairway on hole # 10 narrows as you reach the 150 yard area of this double dogleg par five. Oak trees left and wetlands right make this approach a demanding one. On the dogleg left 11th, golfers from the tips will challenged making par on this 493 par four. 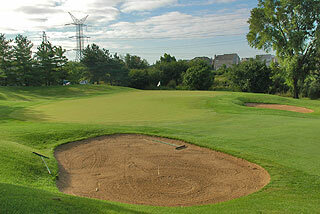 To cut the hole, golfers will need to carry the left bunker and reach the downslope that leads to the 150 yard stake. Otherwise, the right center is the place to be off the tee. There is plenty of room on the 12th fairway, but the green complex with bunkers and swales will test your accuracy on the approach. 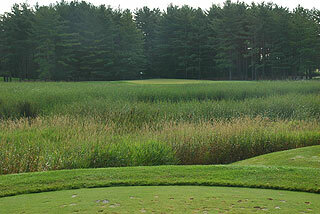 The par three 13th features a carry over wetlands, with some bail out room short right. 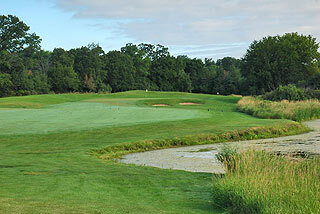 The par four that follows also demands a carry over a marsh, with the 150 area providing an advantageous landing zone. Anything left will have a blind approach to a green protected by sand traps on both sides. A long tee shot can carry the sprawling fairway bunker on 15, landing on an ample fairway. The approach to a peninsula green is a tight one however, as the small bunker on the right sits just in front of a pond that will be the resting place of any shots hit long. A majestic oak on the left and a pond that runs along the right from 150 - 70 yards makes the tee shot on the short par four 16th interesting. The small putting surface here is guarded by grass mounds and sand traps, with some room long. There is mounding to the left and a marsh to the right on the par three 17th, which features a very large double tiered green. Pay attention to the pin placement and go for the flag on this one. The 18th plays to a beautifully sculpted fairway, with bunkers strategically located short left and long right. 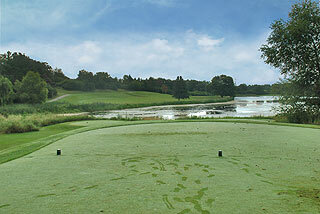 The fairway ends short of the 50 yard area, with the approach dropping down to the green that rests below. A lake is situated immediately past the putting surface, so long is gone! 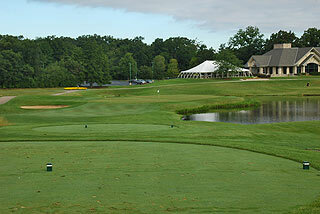 Stonewall Orchard is a beautiful layout with great practice facilities and a nice clubhouse. 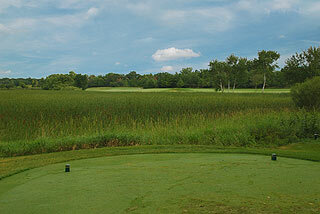 Its location NW of Chicago places it in a very rural and serene setting - an ideal golfing environment. We have been told it is a local favorite, and we can understand why. The Sweetbriar Grill can accommodate 80 guests indoors and an outdoor tent can service groups of up to 200. For more info on Stonewall Orchard and for a link to their website, visit our informational page for the property by clicking here.